1. There are cows in the crosswalk! We know we're back in Abuja when traffic cops, (called 'Yellow Fever' by locals,) keep us waiting for cattle to pass at intersections. 2. Home sweet home! Our apartment in Abuja, fabulously located behind the one and only Domino's Pizza and Cold Stone Creamery in town, welcomes us with more than beds and breakfast! Yup, you guessed it! Large Veggie Supreme and Choco/Caramel Sundaes! 3. Lawal and Siadu are two of the greatest friends and helpers imaginable! Lawal, a Fulani man and Abuja resident, is more than an excellent driver, working alongside us in projects such as demarcating paddocks and borehole repair, but we especially love him for his faithfulness and honesty. Siadu, jack-of-all-trades, lives at our apartment house and does just about anything we ask of him, always cheerfully and well, and with a smile on his face! We are so thankful for these two guys. 4. Drive through shopping! No need to get out of the car to buy wide varieties of items! 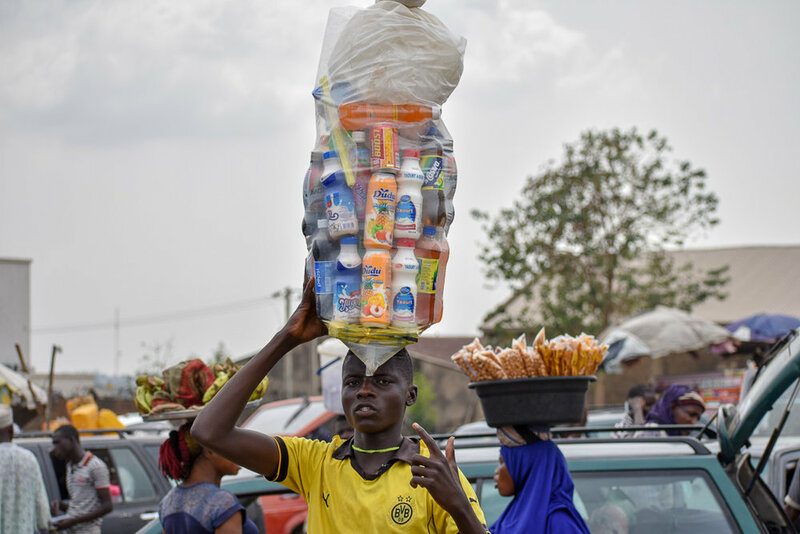 Abuja streets are not only filled with cars, trucks, buses, motorcycles, or cows, but also vendors selling anything from Nigerian dress patterns to phone chargers! How these guys stay unhurt as they dash through traffic is truly a miracle! "How much for this voltage stabilizer?" "Oh, that is a very high quality stabilizer! Only costs N10,000 naira, a very good price!" "No, N5,000 is too low. Give me N7,000." "Well, okay, here you go." And we pay the N7,000. "Oh, that one. It's only N3,000." Ah, sigh, it's great to be back in Abuja again!